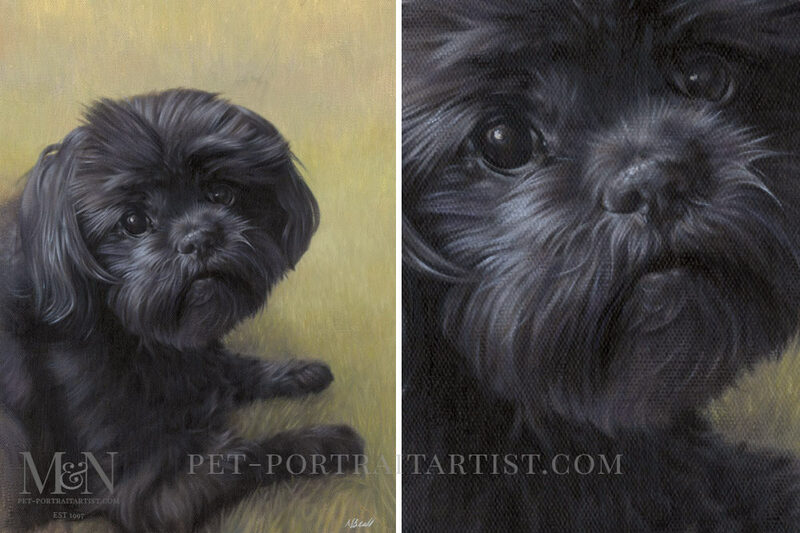 Welcome to the two beautiful pet portraits of Marley and Nohea! Our client Polly emailed us in 2017. She asked if we would be able to portray her two beloved dogs who had sadly passed away. 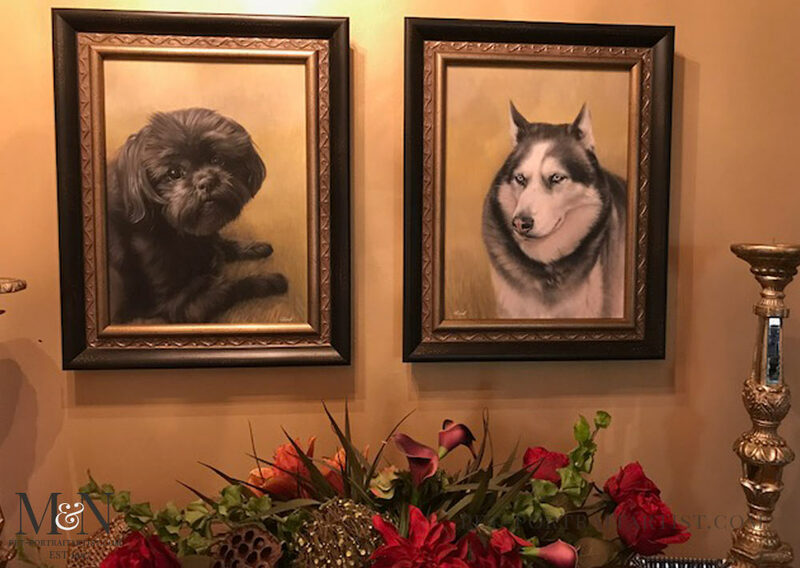 She wanted oil paintings as the centre piece in her home to remember both dogs by. Polly had two favourite photos and we were thrilled to be able to work with them both. Marley, the first painting, was a straight forward portrait in that Marley was exactly like that in the photo. Noah however was a combination of two photos. To add more chest so that he could be similar to Marley we used two photos for the painting. They both works beautifully as a pair! Their paintings are 16 x 12 on Italian Linen canvas. 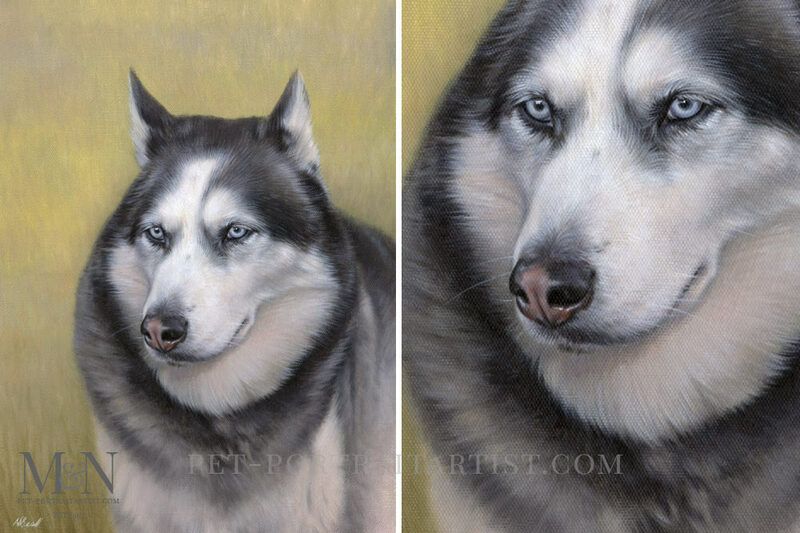 Nicholas usually paints only one portrait at a time, however when he is painting two like this for the same client he likes to have both on his easel at once time. This means he can paint the background using the same colour pallet so they match. We know that our client will be displaying them in the same room together so it is really important to have unity between them both. We are so thrilled that our client Polly loves both portraits and if you scroll down further you can see photos Polly took of the portraits all framed in her home. Our lovely client Polly emailed us a photo of Marley and Nohea framed and displayed in her home. We love the frames that Polly has chosen and they both look stunning on the wall together. I would officially like to thank Polly for taking the photo for us and I have already added it on our dog portraits testimonials page on our website! We finally got Marley and Nohea back from the framer and they have been hung in their forever place.